Kevin realizes that the trauma caused by losing space shuttles turns out to feel a lot like finding out you have cancer — only lonelier. I have the best job in the world. Over the last 36 years, I’ve worked on three human spaceflight programs at the Kennedy Space Center. 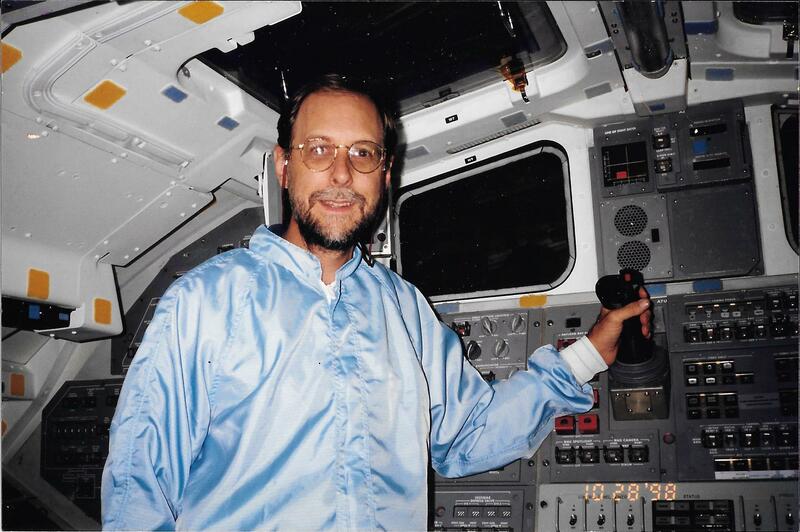 I’ve worked with dozens of flight crew members (our term for astronauts); spent hundreds of hours around — and often inside of — all six shuttles; supported some of the most famous spacecraft ever launched including the Hubble Space Telescope, the Magellan Venus orbiter, and the Galileo Jupiter orbiter. I’ve worked on International Space Station modules and helped build the Orion capsule. The people I’ve worked with are everything the public expects NASA to be: incredibly smart, extraordinarily motivated and infused with excellence. We are driven to perfection, intolerant of mediocrity and merciless in solving failures. On the flight deck of the Orbiter Atlantis, in a rare shot without an “eyes only” hood or gloves. Due to my excessive hairiness, I was normally required to wear a hood whenever on board! Sadly, I’ve had to experience the bad times as well: I worked on both Challenger and Columbia’s last missions; and as part of the team recovering debris in East Texas. During that effort, we lost a helicopter from my team. Two were killed and three were injured. These experiences were deeply traumatic to me personally, as well as for the whole spaceflight community. Receiving a cancer diagnosis is, of course, also traumatic. Mine came in November 2004, when I was told I had mantle cell lymphoma. Then, after a five-year remission in 2012, I was told that it was back. Most (but sadly, not all) children think they will live forever. Adults, while we acknowledge and plan for eventual death, don’t internalize it until the possibility smacks us in the face. Whether it’s the loss of a parent, a national tragedy, or a serious illness, the back of our brain suddenly realizes that death is a real thing. Part of your brain thinks dying is a really, really, bad idea, and it lets the rest of the brain and the body know it: The cold rush of adrenaline, dazed visage and refusal to accept the facts are normal responses to traumatic news. There are long term effects, too. It’s been 29 years since Challenger’s last launch and 12 since Columbia’s failed landing. Yet, to the workers at Kennedy Space Center, these events are still in the immediate past. This was driven home to me last week. The Kennedy Space Center Visitor’s Center just opened an exhibit honoring the crews lost in these disasters and our management team was invited to a special tour. As we entered the doors, one of my colleagues, a (literally) grizzled program veteran, stopped and turned around. “I just can’t do this. It hurts too much,” he mumbled and pushed back up the line. Most of us got sick to our stomachs when viewing the debris or remembering the feeling we had watching smoke trails in the sky. Time doesn’t dull the feelings of cancer survivors, either. How many of us shudder when we visit the oncologist’s office, even after many years in remission. Even after nearly a year, I get a sick feeling when I go to the chemo room for my monthly port flush. I still avoid visiting the unit where I had my first transplant, although I did convince myself to take a fast “fly through” the floor where I had my second. Who are we? We are the collection of our experiences, good and bad. Our personality is constantly shaped by events out of our control. After a decade of cancer, I’m not the Kevin I was at 48. I’m actually a much better, more empathetic, caring and helpful person now. For every horror I’ve experienced, I’ve had a dozen uplifting ones. For every friend I’ve lost, I’ve made ten more. I’ve had the benefit of a second education, supplementing my spaceflight knowledge with a hard-won expertise in cancer treatment. My victory over cancer is measured against the agony inflicted on my wife, children, family and friends; my fellow patients who fell along the way; and the terrific toll on our lifestyle. I must say, though, looking forward for the first time into 30 more years of life, instead of three, the price we paid was worth it. I don’t have a snappy six-word motto to sum up my battle ... but I plan to work on that. For now, I’ll go with this: “Staying alive: Worth the effort."